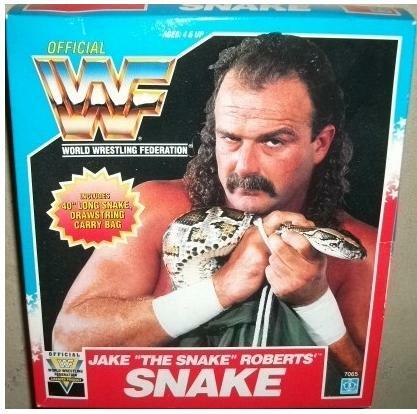 In Brief: In 1991, Hasbro gave kids the chance to act like Jake Roberts with a 40-inch rubber snake. Long before Santino Marella had his "Cobra," Jake “the Snake” Roberts had Damien. LJN and Hasbro both made action figures of Roberts that came with rubber snakes. In 1991, Hasbro gave kids the chance to “get a bigger snake,” as Roberts once famously said, when they released a 40-inch rubber snake that came complete with a drawstring bag. The snake – which most collectors still refer to as “Damien,” but isn’t named on the packaging – was released in 1991, around the time that Earthquake squashed Damien and turned him into Quakeburgers. Jake temporarily brought in Lucifer, Damien’s big brother, before turning heel and abandoning the pythons for a much more sinister cobra. 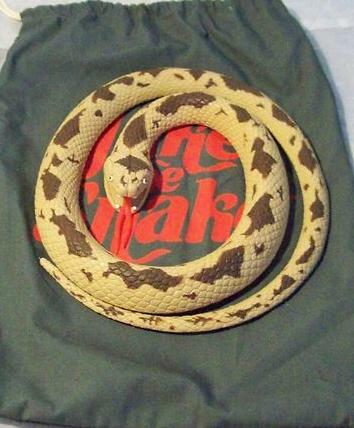 The snake and bag were sold inside a cardboard box with Jake’s image on the front. While Hasbro’s WWF action figures were easy to spot at retail stores and specialty toy shops, the snake was tough to find. As a result, there aren’t many available today. The few that have popped up on eBay in recent months have sellers asking $100 to $200 for packaged items and around $60 for a loose snake with a bag. One that sold recently was a loose snake with a stained bag that fetched $30. If you can be patient, you might be able to find one at a lower price than what sellers are currently asking. Another recent auction ended at just $7.46. In recent years, Jakks-Pacific, Mattel, and Toy Biz have released plenty of masks, costumes, weapons, and other role-playing gear for kids. But, the big rubber snake was the first of its kind: a wrestling-related role-playing item that was not a title belt or lucha libre style mask. Collectors are still waiting on the 2012 Leaf Originals wrestling cards. The cards were originally advertised to go live on July 26, but the release date was pushed back to August 10. A feature column on these new cards will be published once they are released. Several readers have written in with questions on replica title belts. A future Collectibles Column will include suggestions for expert collectors, but for now you can check out shoptna.com, which has just a couple for sale, and wweshop.com, which offers replicas of almost every belt in WWE history.